Summer Olympics is the hall mark of sporting event and they take place every four years and easily the most watched and the biggest sporting competition in the world. Fifa world cup can make a claim to be the biggest single team sport event but Olympics has its own pedigree. 2012 Olympics took place in London which turned out to be pretty impressive both on and of the field, next will be the Rio Olympics 2016 in Brazil and after the success Brazil had hosting world cup, experts believe that Rio will easily surpase London Olympics which generated around $1.1 billion in domestic sponsorship deals. 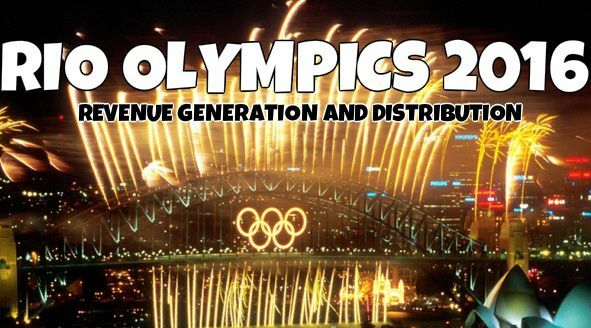 Today we are going to take a look at how the Money is generated by Olympics and what are the distribution channels for IOC. 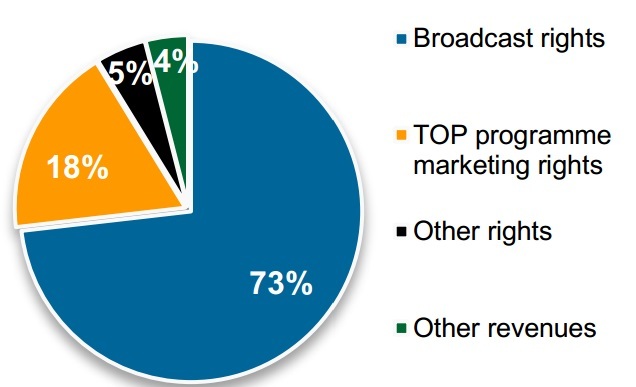 Through different channels, the biggest are the lucrative sponsorship deals from both domestic and foreign companies and sponsorship makes 20% of the total revenue and the TV Broadcasting deals which makes around 70% of the total revenue Olympic games generate over the Quadrenniums period which include both summer and winter olympics over the four year period. Summer Olympics makes up 60% of the total revenue generated in a Quadrenniums cycle. Than of course we have image rights licensing and the ticketing and hospitality which makes around 5% and 3% respectively. 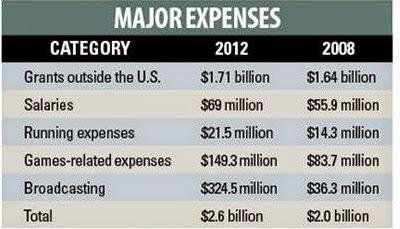 here is a pie chart which shows how Olympics make money. 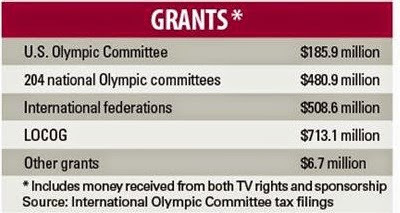 One thing to be noted here is that domestic sponsorship income, ticketing and licensing revenue belong to the host olympic committe and it does not belong to IOC. Organizers for the 2016 Rio Olympic Games has already announced the 19 sponsorship deals with domestic companies bring in 2.6 billion reals ($1 billion) and they have started the negotiations with key industries like Airlines, Oil & Gas, utlities etc and expected domestic revenue to reach $1.5 billion which is almost 50% more than what British Olympic committee made during London 2012. 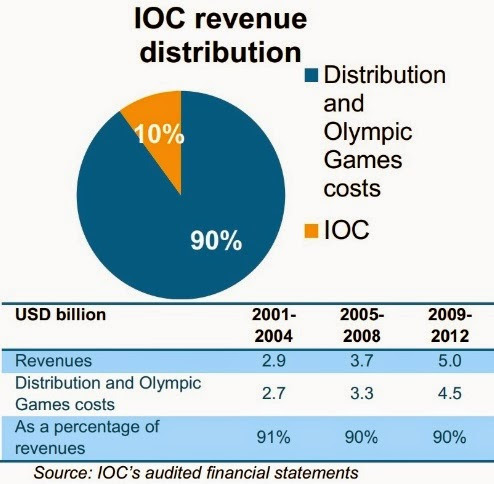 Following Pie chart shows how International Olympics Committee expecting revenue through different streams and what percentage the money will come from different channels. Rio Olympics is set to earn more than double the tv broadcasting money than Olympics in 2004.
administrative costs. 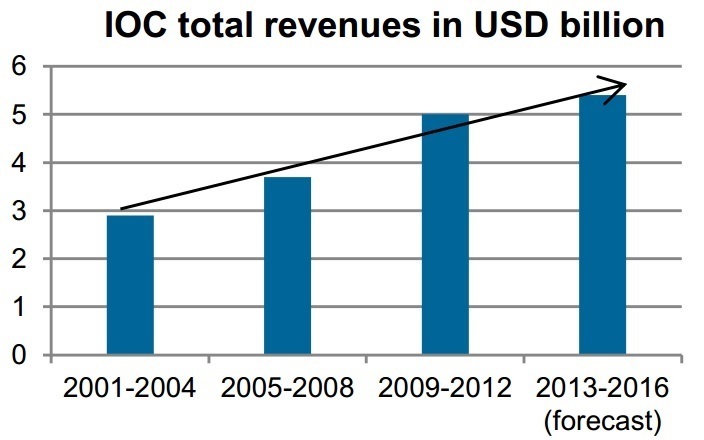 The IOC distributes 90% revenue to each of the 204 NOCs throughout the world and other organizations, such as, The Organising Committees for the Olympic Games (OCOGs), International Federations (IFs) etc and part of it is also used on the expenses of hosting Olympics. 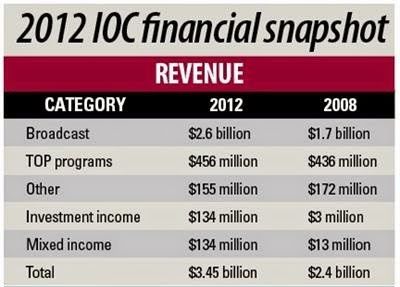 Since we dont have the actual revenue and numbers figures for 2016 Olympic we can take a look at 2012 London Olympics and the four year period 2009-2012 how IOC made money and where and how it was distributed. take a look at following chart.